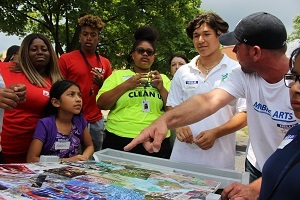 The James Pearson Duffy Department of Art and Art History will provide one-day Mobile Art Workshops for youth at various community sites in Detroit. Local musicians working in a variety of genres perform throughout the duration of each workshop. Mobile Arts Workshop participants learn about abstract art and basic design fundamentals through a variety of art making processes using reclaimed materials provided by the Mobile Arts workshop staff. Each workshop includes warm-up sessions followed by extensive collaborative projects, accommodating approximately 10-15 participants ranging from the ages of 12-18 years old. Artworks created during the workshops are collected by the Mobile Arts staff and are installed at the Art Department Gallery for its annual Mobile Arts Workshop Exhibition. The exhibition opens with a celebratory reception that is free and open to the public. Examples of mixed-media works by Basquiat, Schwitters, and Rauschenberg will be presented prior to the hands-on portion of the workshops. Participants will begin with warm-up exercises and create individual collages on 10' x 10' panels using paper, oil pastels and paint. Participants can take their individual collage panels with them after the workshop is completed. Participants will expand on the exercise portion and create two 2' x 6' collaborative compositions on panels using basic and advanced reclaimed materials, including: newspapers, magazines, colored paper, wax, paint, oil pastels, and various adhesives. The panels will be coated with a clear varnish to integrate the materials and protect the surfaces for extended exhibition purposes. The panels will be displayed vertically as diptychs at the Art Department Gallery for its annual Mobile Arts Workshop Exhibition. A public reception will be held for the workshop participants on Friday, September 7, 5-8 p.m. The diptychs will be returned to each workshop site after the exhibition closes. Follow with the Mobile Arts team on social media! Facebook: www.facebook.com/MobileArtsDetroit, Twitter: twitter.com/WSUgalleries, Instagram: www.instagram.com/waynestategalleries.